Since it was last discussed here, my stance on this “style” has softened a bit. I have found it useful to view it as more of a Pilsner which used the wrong hops and was fermented with an ale yeast. On one of the last brew sessions of 2014, I was after a hint of malt character in a pale beer; no crystal malt, because this isn’t, after all, to be confused with an American pale ale; and very well-attenuated but still with a bit of mouthfeel, and not overbearingly hop-acid heartburny. As the picture faithfully shows, it’s a pale git. It looks like a light lager (or even cider if you ignore the foam), but it smells like dried lemon and pine needles. Those elements from the hops show up in the flavor as well, with some darker, deeper notes of musty herbs. The hop character isn’t too bright and brash, the bitterness makes a graceful exit, and I’m fairly pleased with the balance. It is certainly very well-attenuated, but not totally scoured out, thanks to a bit of slickness from the CaraFoam. The stout malt gave great extract (as usual) and helped make for a very light color – and my notes from brew day comment on a great cold break, too – but its flavor is slight … which I realize isn’t the point of my misguided Pils, but next time I think I might incorporate a bit of Maris Otter or Golden Promise for a fractionally higher amount of malt flavor. But overall, I will consider ground utterly broken. How about you, reader? Any good session IPA lately, your own or storebought? This entry was posted in homebrew and tagged all-grain, Centennial, CTZ, IPA, MCI stout malt, pale ale, recipes, Simcoe, tasting notes, Wyeast 1217 by MD. Bookmark the permalink. He’s back! recipe sounds great. Good to be back – thanks for the comment! I’m not a big fan of this “style” either. However, I really have enjoyed Ballast Point’s Even Keel. Worth a try. Good to see you back, Mr. Dawson! We just kicked a keg of a Session IPA with a 2:2:1 ratio of Calypso:Legacy:Columbus. 35 of the 40 IBU (tinseth, pellets) came from a whirlpool addition. The 30 min whirlpool was calc’d like a 20-minute kettle addition. Double that total whirlpool hop mass in the same ratio was then used as a dry hop addition. The result was reasonably bitter, yet absurdly aromatic. The apple/pear from the Calypso, the berry/citrus from the Legacy, and the dank citrus from the Columbus all played really well together. It’s on the list for a re-brew. Sounds good! Thanks for the reply. you’re welcome, and welcome back. I went and rechecked my notes. The dry hop load was huge for a 5 gallon batch: ~150 gm/~5.5 oz. I let it sit for ~60 hours at 68 F before cold crashing. The idea was to extract the essential oils and other “good” stuff but leave the tannin/grassy flavors/”not so good” stuff behind. It mostly worked. A week in the keg and the rough edges were rounded out nicely. I’m going to try 48 hours next time and see if it takes less time to smooth out. There’s an *alleged* beer style (origin unknown, not that I’ve looked into it) that’s become the “it” style Down Under this summer – XPA. I’m not clear on whether the X implies extra hops in a pale ale, or extra-pale, but XPAs seem to have both attributes. Your brew would definitely fit the category! They are delicious. I’m about to re-brew something of a session IPA. Pale +15% rolled oats, 30IBUs, hugely dry-hopped. I like what very pale wort does to make hop flavours extra bright and yellow-tasting. Glad to see you back Dawson, you were missed. I have had great success with Drew Beechum’s popular “Pliny the Toddler” recipe, which calls for MO and 2 row as well as some carapils. The combo really delivers a solid, malty flavor for such a small beer. I, for one, having been digging all things session strength lately, and I am delighted with the session IPA trend. Perfect post just in time for the southern hemisphere peak summer brew days to come. For getting some malt flavour to drive through the hops maybe mashing higher whilst using some more of these character full base malts instead of the Carafoam? Had an awesome session IPA recently from 8-wired, semi conducted but it had some crystal malt character and hops fairly typical of the brewery (US NZ hops all the way through). Before I tried “Pygmy Owl” by Big Sky Brewing I didn’t believe in this “style” either, but its just like you said, it can be like a well meaning pilsner with some interesting hop choice. As for the malt I dont like it when they try too hard to make it full, a dry crisp pilsener has plenty of satisfying malt character without being too full right? Glad to see the post and Happy New Year. Founders All-Day IPA Session beer leans in this direction. I must say it is very clear – no dry hopping? Yep, All-Day was one that helped change me to a slightly less-grumpy old man. And nope, no dry hops but plenty of Biofine. Welcome back MD!! I actually brewed the karma citra from northern brewer. I was very pleased. I just sold it as a pale ale. I haven’t had to many commercial styles. We get founders and that one is solid, and it comes in 15 packs which just beckons the redneck in me!! Recipe looks great. Cheers!! My friends and I have also been very happy with the Karma Citra from NB for a sessionable IPA. Good to see you back Dawson and that is an impressive beard you’re sporting in the recent C&B episode. I’ve brewed what I call a “session IPA” or maybe “Extra Pale Ale” a few times. It was a surprise hit at a party for the OSU-Michigan game late last year, and a whole keg of it was trained rapidly. Your analysis of the style as being pilsner-ish intrigues me. I might try re-brewing this using Crystal 10 instead of the Crystal 80, and use Pilsner malt instead of the Pale ale. I drink a lot of Terrapin’s RecreationAle. its pretty tasty. But the other watered down hop bomb beers I’ve had are totally out of balance. You can’t put 80 ibu’s in a 4.4% alcohol beer and make it drinkable. The Founder’s All Day IPA 15 pack I bought is just sitting in my fridge. Its hard to drink. Very highly carbonated, bitter, thin, and harsh. That being said, my favorite style is americanized English bitter. I love sneaking in a bit of amarillo/cascade/centennial into a good golden/summer bitter recipe with a nice english yeast (lookin at you Wyeast 1469). Thats my kind of drankin’ beer. I brewed a barely 4% session IPA; all Columbus hops, 76% 2-row pale, 13% c-20, 8% flaked oats and 3% wheat. Mashed at 149 for 75′ and 170 for 10′. I fermented it with rinsed WLP060 right at 70 degrees. It’s in the keg now and overall the flavor is good but it is pretty thin. I think mashing higher would have helped but also, as you mentioned, some base malt with a bit more substance would likely make a difference. Mainly I wanted to get a better sense of what Columbus does and it surprised me with it’s fruitiness. The beer was a test vehicle. I’d like to brew this, but I didn’t save my pitch of Wy1217. INYHO, everything else being equal, will Wy1056 achieve a TG of 1.009? If no, what would you suggest as a replacement yeast? Thanks, MD! 1056 would be good; 1450 would do nice things for mouthfeel. Thank YOU, DK. I just finished (about 30 minutes ago) kegging up a batch of a SMaSH (Maris Otter and Citra) IPA that I built using 1450 (Denny’s Fav). That was my first batch with that yeast and it just killed it. A week out I had 80% attenuation and the sample I am sipping (although warm and under-carbed) is great. I will be using that stuff again. I have a pro-brewed single hop Citra in the fridge that I will be doing a side by side session with later this week. Day 9: Wy1056 terminated at 1.008-1.009, everything else being equivalent except CaraPils stood in for CaraFoam and my hops were all pellets. Delicious beer, MD! It won’t last more than a couple weeks around my house. Awesome, thanks for the update – saw your pics on FB, it’s a good looking beer you have there, too. Just yesterday, I found 8 bottles of a batch that I thought was all gone. It is an all cascade pale ale (sipping one now). I used just a little bit of crystal malt (20L & 80L) to add some malt character to the plain old American 2-row, but then a bit of white sugar to dry it out. Then I accidentally carbed it a little high. Turned out to be one of my favorite hoppy homebrews. It had a modest dry-hop, only 1.5 oz. I think it qualifies for this category. And I’m right with your assessment of the ‘session’ IPA really just being a Pale Ale. However, being extra dry and highly carbed takes my beer slightly out of the typical Pale Ale territory. And the aspects of your brew that you outlined make it a slight variation on the standard Pale Ale as well. Still, I simply call mine a Cascade Pale Ale. Although, my wife kept trying to convince me to call it The Accountant. To add some examples I’ve enjoyed, check out Atwater Grand Circus IPA, Stone Go To IPA, North Peak Wanderer and of course Founders All Day IPA. Can you tell I’m from Michigan? Yesterday I threw together a quick 10 gallon semi-session IPA. The OG was 1.054. Used 20# of Marris Otter, 1# of Cara-Pils, and somewhere around 50 IBU’s. Most of it thrown in the last 15 min with 10 oz of home grown Cascades. Thanks for all of the inspiration from your blogs and videos with Chip! What do you suspect your final IBUs to be? Curious because my favorite session IPAs are all of the English IPA tradition (bitterness ratios of appx. 0.8). Cheers to the Anglo-American session IPA! I need to doublecheck, but IIRC it was in the low 30s … a bit below that BU:GU ratio, but it’s quite dry and lean so it seems more bitter than it actually is, I think. Whew…I beginning to worry this blog was dead. Been enjoying Everybodys Brewing Little Sister “ISA” quite a bit as well as Laurelwood Pale Pony “ISA”. Although I really think of them as hop forward pale ales, tbqh. I am a fan of the Little Sister, too! Rock and roll will never die, Brandon. good to see your back! Hey check out Two Roads’ Lil Heaven if you can get it. Interesting blend of hops. A bit rough on first sip but I’ve grown to love the stuff. I had good luck with a 10 gallon batch with 19# MO, 1# Victory, Citra at 60,10,flameout and dry hop. 1272 Wyeast attenuated to 1.011FG. It had a pleasant maltiness, and typical citrus flavors from the citra, although the aromatics subsided pretty early on. 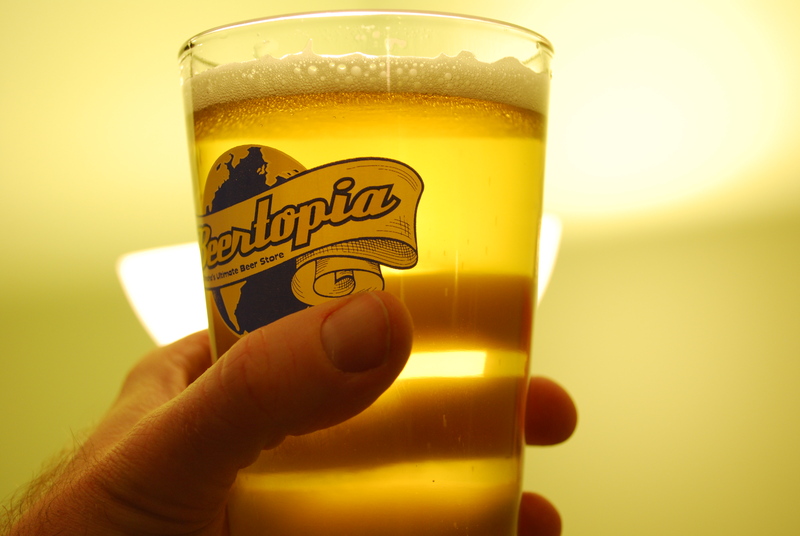 Thanks for reppin Omaha, NE with the Beertopia Glass in the pic. Where did you get that? Hells yes – that pint glass came from the source, where a stop was made en route to Mahoney State Park on a family trip years ago. Nice. I actually work across the street from Beertopia, so you can imagine I’ve spent my fair share of dollars in that joint. I would be much poorer if I worked across the street from a place like that!